Before buying followers on Instagram was a common practice, before Russian trolls made fake news an Olympic sport, we had linkbuilding. Today, we still have linkbuilding, its just that you haven’t noticed it — or have you? Welcome, to the Twilight Zone, dear folks. You are about to go through a linkbuilding crash course. This will help you preserve your website, detect potential problems in content or consider why you keep receiving strange emails from strangers wanting to get their links all over your content. Rod Sterling in the Twilight Zone TV series. Note: If you are a website owner, a marketer, a blogger, a social media specialist or a regular user of the internet (and everything else in between)…you should take the time to read this! Links are basically a popularity contest. Linkbuilding is the process of gaining links to your online content in order to boost your visibility in search engines. Through links, search engines can analyze popularity but also other vital metrics such as authority, spam, trust. Google uses links to establish which websites are popular with users, are trusted by users or are seen as spam by users. The more popular a website is, the more a link from that site will have value. Wikipedia or Huffington Post have a lot of websites pointing to them which is a signal for search engines that these websites are probably important or at least very popular. Here is an example of linkbuilders trying to sell links on well-known publications that may not be aware their platform is used to peddle paid links. Links that are topic-specific and highly related to your subject matter are worth more than links from general or off-topic sites. A link from a dog training business pointing to an SEO training website (like the one I run) will have less value than if Smashing Magazine (a website recognized for its topical authority on the web) will. Which means that placing a link on “SEO training website” would have been an amazing opportunity for me. A text link tends to have more weight than an image link. Furthermore, most people forget to provide an ALT attribute for their images, which means that Google will have a hard time getting context regarding the link placed on the image. Links can also be placed in iframes. You know what would be an even better anchor than “SEO training website” for me? I would love to also push a local signal on top of a topical one with “SEO training in Montreal” Why is that better than placing a link on a random word like “platypus”? Well, because one of the strongest signals used by search engines is anchor text. What is anchor text? 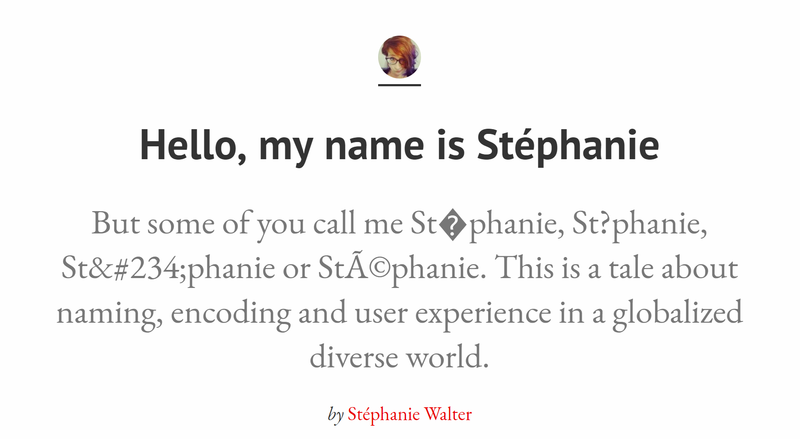 Anchor Text is the visible, clickable text in a hyperlink. For most of us, it’s the blue text that’s underlined, like the ones you see below. As you can see, Smashing Magazine has made it a mission to explain why links should never say “Click Here”. The notion of a “link neighborhood” means that if a website is spammy and links to another website, Google will be suspicious that the other website is spammy as well. This is important because sometimes, websites are targeted by negative SEO attacks. One of the quickest ways to sabotage a competitor’s organic visibility is to have a lot of spammy websites pointing to its website. This is where the notion of link neighborhood becomes incredibly important. Link signals tend to decay over time. That’s why it’s important to keep earning new links over time. This helps establish the pertinence of a website. But you have to be careful: If you keep earning links from hype websites that aren’t necessarily trustworthy, your website could be seen as pertinent but not trustworthy. It’s a fine balance between authority and pertinence. Search engines treat socially shared links differently than any other type of link. The SEO community is still debating how strong of a signal social links are. Getting a link from a website that is considered a reputable and expert source of information is a highly valuable asset. Let’s use this article to do some good and give a link to someone in Web that deserves it. 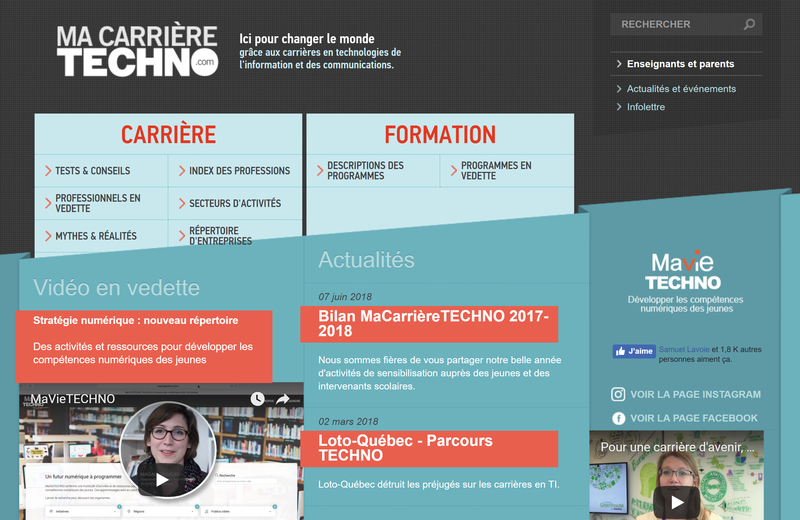 Meet Nicolas Steenhout, a great accessibility consultant in Montreal doing great work. Bonjour Monsieur! I hope this link helps give your work more visibility! We receive some type of communication trying to get us to put things on our websites for strange reasons we don’t understand. Someone requests or demands, depending on how combative their writing style is, that we guest blog for free on platforms that we do not know, trust or like. We get folks peddling SEO services. They use scare tactics to push you to pay them for their services. 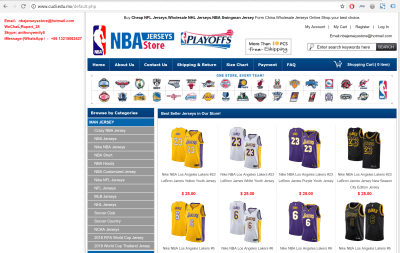 Websites get hacked for links…or worse. If you notice a broken link in a quality website, you can email the owner and say what page the link is on and what could be a solid resource to replace the current webpage that’s no longer available. Of course, the replacement you offer just so happens to be from your own website that you want to rank in search engines. There is a reason why strange spammy comments keep trying to peddle certain products or websites – it’s called linkbuilding. If you can’t be first because you are the best, then buy a bunch of links to make your competitors go down in Google. That’s basically what negative SEO is. 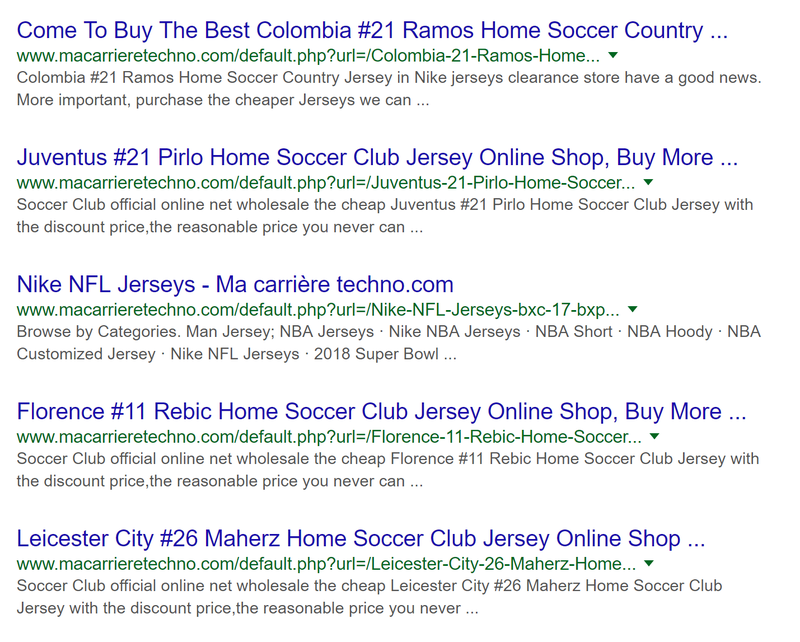 Here is a real life case of negative SEO if you want to see how this can happen to any type of website owner, not just big startups or famous people. I have had many bloggers complain to me because they had been duped by agencies “buying” a sponsored article for a year on their blog. They discovered later on that what the company actually bought was a link that they could control. If you get bombarded with emails asking you to review a product or add a link in your blog article, chances are that you have been targeted during a link outreach campaign. 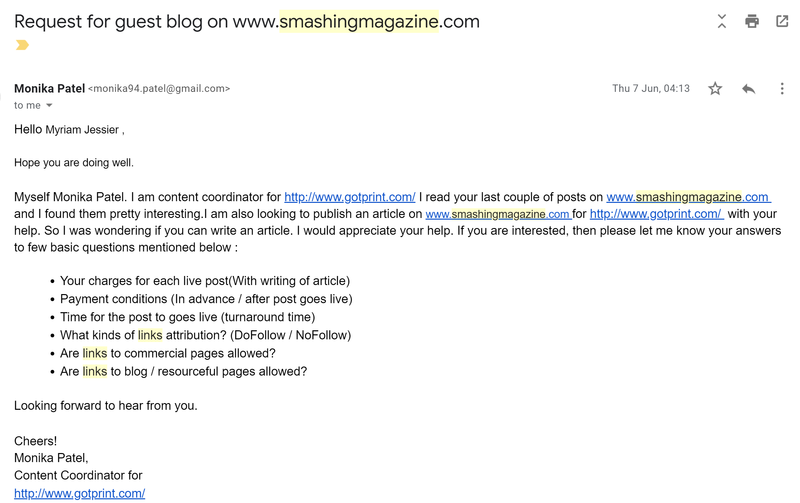 You can always decline or simply not answer this unsolicited email. 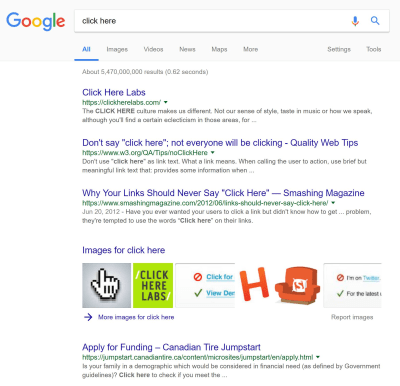 On the flipside of the coin, if you get offers to place your links in some highly regarded publications, know that this is an offer the person is making you to place your links on certain website. If someone asks you to create an article on their platform, the often want free quality content with your notoriety to promote it in order to garner links. If on the other hand, someone offers you free content for your website, chances are that it is for linkbuilding purposes. A Private Blog Network is a network of websites with great SEO metrics used to build links to a main website in order to help it rank higher in search engines. It means that someone usually ranks multiple websites high in Google in order to use them to place links that will boost the visibility of a chosen site. Google does not appreciate PBN efforts or link exchange efforts and routinely penalizes networks of websites. There are many linkbuilding tactics that push for the creation of tools, content or other types of media that is so good, so useful and so relevant that they will naturally garner links from other website owners. We won’t detail them here but they usually work well because they provide something useful that deserves to be shared with others! Read this part if you are a website owner, a UX, a customer, a visitor, a blogger, my friend Igor (hi Igor, please read this!) or anyone else using search engines regularly to find information. Let’s get started by giving you access to the official Google guidelines on the matter. Website guidelines vary from search engine to search engine. You can check each search engine’s guidelines but oftentimes, the broader concepts of what qualifies as a good website in terms of SEO are the same. Google clearly disagrees with paying for links or selling links. However, keep this in mind: not all linkbuilding efforts are bad. Earlier in this article, I gave a shout out to a friend of mine because I know that it will help give his website some visibility in search engines. Offering a link is a way to show your support for a product, an article, a tool, a website, a person. It is a vote of confidence in their favor. If you go out of your way to do it, technically, that counts as linkbuilding. Linkbuilding is also a way to make money. Some website owners may leverage linkbuilding to earn money despite legal regulations and Google’s guidelines. You can signal bad links and anything strange going on that may be related to a hack, malware or even paid links to Google. You can report bad links very easily. If you want to review the entire list of what constitutes a bad practices in Google’s eyes, you can head on over to this official documentation. If you are a blogger, make sure you are aware of your rights and responsibilities when it comes to linkbuilding efforts. Make sure to update your key pages to reflect your linkbuilding policy. This could be done in the about page, the services page if you offer services or the contact page. Take the time to specify if you accept of refuse commercial or affiliate links in the content of a guest blog post for example. This will also help avoid nasty linkbuilding surprises in the future. Nofollow: You Can Have Sponsored Content And Still Respect The Guidelines! So what do you do if you realize that someone is using your website to place a link? Well, if this is something that was done legally, you can fix the situation by placing an attribute on your link that will signal to search engine bots not to follow the link. A nofollow link is a way to make sure that links from sponsored posts are not going against Google’s guidelines. This type of link cancels the linkbuilding benefits as Google gives them no love because the nofollow tag in the code signals “do not take this link into account.” Website owners and administrators should know how to make a link into a nofollow link as it can be done quickly and easily. So, what do you do if you are asked for a link in exchange for a review? 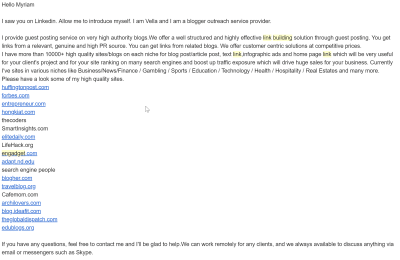 This is the most common way most bloggers are approached in order to get links placed on their websites. Here are some guidelines for bloggers that receive free products in exchange for reviews. If you think your website is hacked for links, you must first secure your website and do a security audit. The second step would entail cleaning up the links and the third step includes submitting a disavow file to Google that signals any shady domains that may be pointing to you because of hacker activity. If you haven’t changed anything and you see your organic traffic go down, make sure it’s not a link issue. You could have suffered an attack. We recommend you use the Google Search Console tool available to all website owners and administrators. You must validate that you own the website and then, you will be able to receive an alert if Google detects something is very wrong with your website. 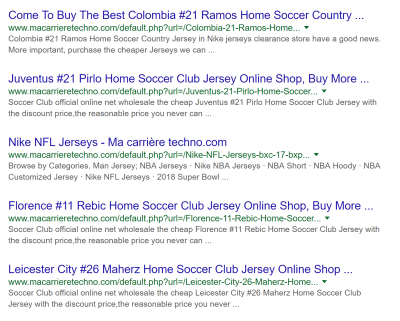 Careful, if something is wrong with your website, it could mean a penalty and cause a substantial organic traffic drop. To know more about the types of penalties and alerts Google Search Console provides, you can read an article on this topic or check the official documentation. This is a very underhanded technique to obtain links. Some individuals will pay for a premium theme or plugin or software and offer it for free on torrent websites or forums where free or hacked versions of premium products are made available. 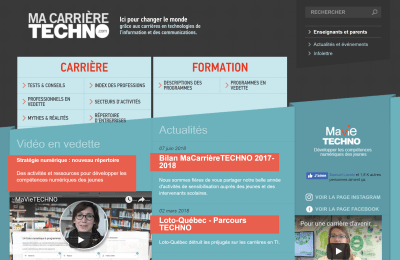 When someone downloads the theme and uses it on a website, the doctored version of theme is used to place links in the website. Oftentimes, the owners never notice that their website is hosting parasite links. If you get an email from the Google Search Console team telling you about some spam issues or other problems that cause you to break their guidelines, you should investigate immediately the source of the problem and fix the issue fast or you could risk a penalty. Always check the links before placing them. Click the links and see where they lead. 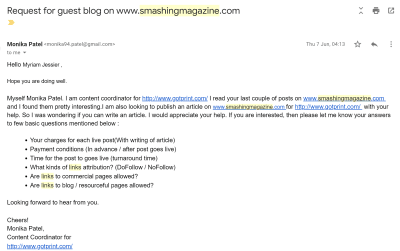 You could be provided a link that looks like a high-quality content but instead, it points to a spammy page. Make sure to ask if a link is an affiliate link. Affiliate links are links that contain information that helps track a sale back to the person who promoted the product. These affiliate partners get a cut each sale that is attributed to them. Companies like Amazon and Forever21 among others have affiliate programs. You do not want someone promoting a product purely for money and you do not want to lose the trust of search engines and human visitors. Go ahead, click on the link and check out the website before you do anything else. Otherwise, you will end up contacting your competitors, unrelated blogs, spammy websites, etc. Most websites have a page, it can be the contact, advertise or about page, that lists the specs and guidelines to collaborate with the websites. Respect what’s written on there! Do not bother folks that clearly said they do not want to be contacted for links. No, you are not the one that will make them change their minds. Yes, we’re sure. This meant that a lot of companies wanted to contact the owner of a website that had more than 1000 high-quality websites referring to it. 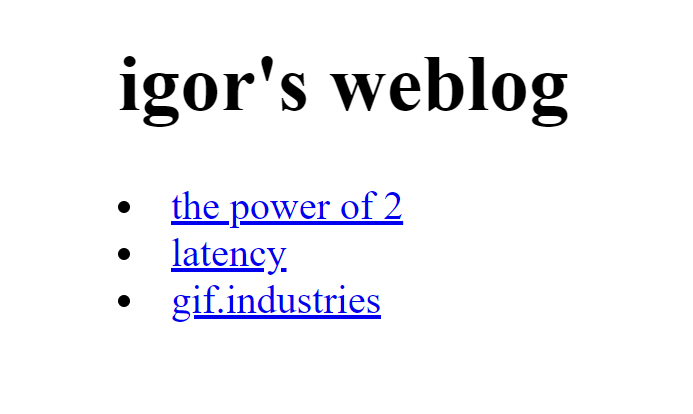 But if they had bothered to check out Igor’s website, they would have seen that nothing was on there. 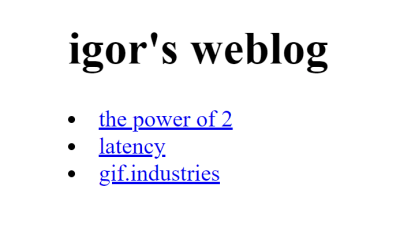 Back in the days, this website just read: igor’s weblog and the archive was hidden in the code. You had to know where to look for it… or you would find it very easily if you happened to be a bot. That’s why the metrics were the so high: only a bot and those in the know would discover and share Igor’s content. I get emails telling me to ask my boss if the company can place a link on my website. Now, quick reminder, if you go on myriamjessier.com and contact me, the person with an email that contains the words myriam + jessier, chances are that you are talking to the owner herself, right? Which leads me to another point: write my name correctly please and do not address me as sir, or dear, or dear sir. 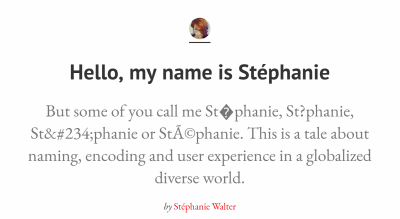 This is a common issue that Stéphanie Walter has as half of the Internet doesn’t seem to know how to spell her name. If you do not disclose why you are asking for a link and that there could be a risk to a website selling you a link, then you are not being transparent. Don’t reach out to experts who do what you do for a living. I receive linkbuilding offers (buying and selling) from other search engine optimization “specialists” all the time. If you found me on the web and are offering to sell me links because my website isn’t visible enough, then maybe, just maybe, my SEO efforts are working no? There’s money in the banana stand and in linkbuilding. Not all links are equal, key metrics are : authority, freshness, placement, relevancy. People will go to extremes to get links so if a “great deal” is offered to you, look for the hidden link in there! Secure your website to avoid SEO problems. If you make it hard work for hackers, they will often give up and move on to an easier prey. If you want to help someone out, make sure you give them a link with a good anchor! It really helps!